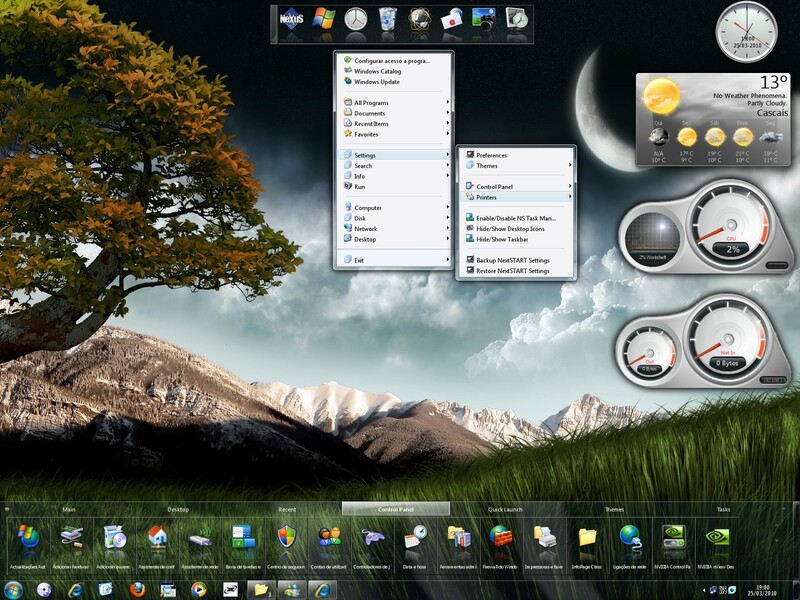 Winstep Forums • View topic - Winstep releases Winstep Xtreme 8.2! Post subject: Winstep releases Winstep Xtreme 8.2! Winstep is proud to announce the release of Winstep Xtreme 8.2 Final. You can download the new Winstep Xtreme 8.2 version from HERE. * Now 100% functional in Vista: support for user and system tray notification areas, task handling and window previews work for both elevated and non-elevated applications, tasks and network connections belonging to elevated and non-elevated processes alike can be terminated with a single click, theme fonts are correctly installed when importing themes, theme wallpapers 'stick' between reboots, CPU and RAM Meter desktop modules are now able to display performance information for all processes, including services and applications running with elevated privileges, and all user data has been moved out of the read-only Program Files folder and into the Public Documents folder. * Live window previews for NextSTART taskbar buttons in Vista. * Improved functionality of groupped task menus which now open automatically when dragging an item over a groupped tasks button. * 'Run As Adminstrator' (Vista) and 'Run As Another User' (NT/2K/XP) item property setting that works for documents as well as applications. * Improved WorkShelf startup time. * Fine tuned initial configuration which should now pick the correct international settings for the Clock and Weather modules, select the correct Network Interface to monitor for the Net Meter module, and set the email client used by the Email module. * Shelf and docks icon sizes now range from 16x16 to 256x256 in 1 pixel increments. * New 'Capture Desktop' Internal Command that takes a screenshot of the current desktop and saves it as a JPG file. * New 'Close CDROM <drive letter> Door' Internal Commands that complement the existing 'Close CDROM Door' Internal Command when more than one CD/DVD drive exists on the system. * Added Hotkeys for toggling Desktop Modules in and out of view. * Redesigned Active Network Connections panel that rivals the functionality of Sysinternal's TCPView. * Standard desktop right click menu now pops up even when desktop icons have been hidden by WorkShelf or NextSTART. * The NeXuS tasklist now displays minimized applications as application icons instead of small window titlebars. * New icon used for unknown/not found items. * Added a 'Enable/Disable Time Announcement' option to the context menu of the Clock module. * NeXuS control icon and sub-dock indicators now skinnable. * Shelf content offset from edges is now definable by the skinner. * Horizontal and vertical offsets for Quick Launch icons and taskbar button captions. * New Fonts Manager in the Themes Manager Preferences tab that makes it easier to manage fonts used by the current theme. * Icon sizes for NextSTART menus now range from 16x16 to 32x32 in 2 pixel increments. * Provided a work around for a MS GDI+ bug that prevented themes from using newly installed fonts without restarting Winstep Xtreme. * NextSTART menu icons are now 'lazy rendered' when browsing network folders, thus allowing menus to open nearly instantly. * One click registration: Winstep Xtreme can now be quickly registered by simply double clicking the license key. * Fixed many miscellaneous issues. There are many other additions and fixes in the Winstep Xtreme 8.2 release. You can see a complete list of changes to the WorkShelf and NeXuS components HERE and to the NextSTART component HERE.